The ATL Saver fuel cell range is manufactured from a unique ATL565 material. Each one is supplied fully foam baffled to help reduce fuel slosh and suppress explosions. All the saver cells, with the exception of the 20 Litre version, are fitted with a 6 x 10 top plate. Constructed from a unique, tough plastic alloy. LENGTH x WIDTH x HEIGHT. 330 x 330 x 230mm. Standard Saver Cell Top Plate. 2¼ Wisco Neck and ¼ turn Cap. Feel free to ask us. You can send a message. Our race accessory shop offer a friendly, knowledgeable customer service both on site and online. You only have to check our feedback score to see we're the most reliable sellers in Race, Rally and Karting. The item "ATL 20L SA105 Saver Cell FIA Approved Fuel Tank Race Rally 20 Litres PETROL" is in sale since Monday, March 05, 2018. 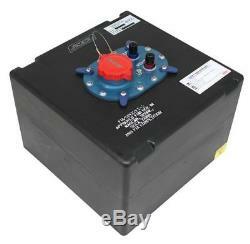 This item is in the category "Vehicle Parts & Accessories\Car Parts\Air Intake & Fuel Delivery\Fuel Tanks".